Dilution control systems are gaining popularity and are popping up everywhere. For those unfamiliar with this system, dilution control is a chemical management system consisting of equipment, closed loop chemical concentrates, and water. Through the use of equipment, chemical concentrates are combined with water and dispensed as ready-to-use cleaning solutions. These systems provide many advantages. They help control costs, improve safety, and have environmental benefits, such as reduction in packaging and shipping. Dilution control systems provide customers with a wide range of chemicals they can choose from. An added perk of this is that they can switch out one product for another with ease, offering unlimited options. In general, customers that use a high volume of cleaning chemicals are a good fit for chemical proportioning systems. With these systems, customers will get more accurate dilution ratios, resulting in cleaner, healthier facilities. It is also good to note that these systems are more cost effective than ready-to-use products. 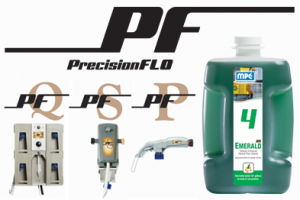 Misco’s Precision Flo dilution control system is a perfect blend of style and performance. These dispensers are products have been designed for optimal efficiency and ease of use. For more information, check out our website or contact your salesman today.